Posted under Library, Reference Question on Saturday, July 18th, 2015 at 10:55 am, by Brian Herzog. Post and comments available via the RSS 2.0 feed. Both comments and pings are currently closed. Just out of curiosity, what’s that on the yearbook cover? It looks like a cross between a fishing rod and a lightsaber! @Elisia: you know, at first I just thought it was a spindle (part of a loom for weaving textiles, which is a huge part of Lowell’s history), but now that I look at it closely, I think it really can only be a fishing rod lightsaber. At least, not my idea of a spindle (spindles in shuttles). 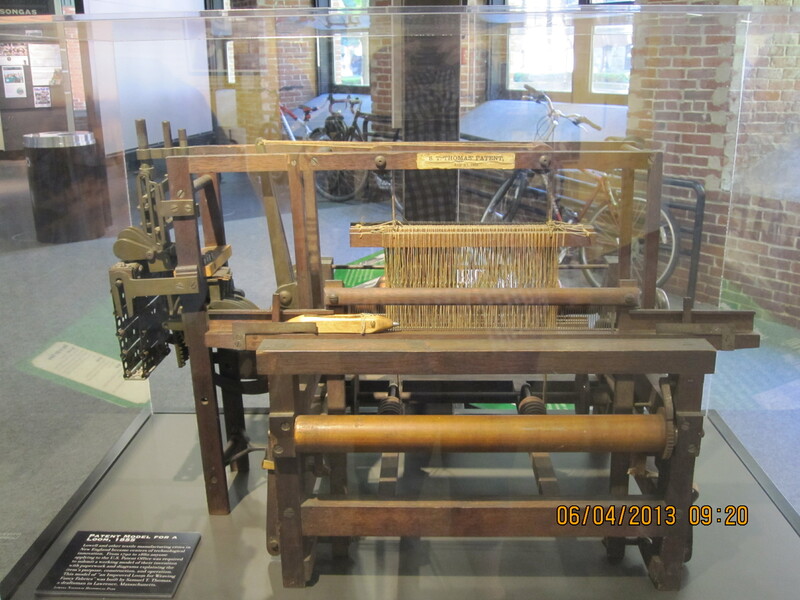 Now I’m curious though, so I’ll go to the mills at the Lowell National History Park the next chance I get and see if I can spot it in their looms. It kind of looks like the cylinders sticking up on the top left in this picture, but I’m not sure – when I find out, I will post it here. I think a fishingsaber sounds much more exciting, though. Ancestry.com also has a collection of yearbooks digitized and searchable- of course, you need an account to access it, but many libraries do. Unfortunately, they’re no longer digitizing yearbooks and adding them to their collections. My library had extra copies of our high school yearbooks and I contacted them to see if they would want our copies to digitize. They emailed me back to say they’re no longer doing yearbooks, which is a shame in my opinion. @Jill: thank you, I did not know that. And it is a shame – I’m sure it’s expensive, but it does seem like a valuable genealogy resource. I’m sure it was a business decision, so maybe they decided there were enough alternatives available that it wasn’t profitable enough for them anymore – which would be good news, if you’re just looking for yearbook photos. Wishful thinking though, I suppose.